The first mention of kampot pepper is in the 13th Century when Chinese diplomat Zhou Daguan visited the Angkor Empire. In 1900 pepper was the largest export crop in Cambodia and production had reached 8000 tons per annum. In the Sixties the Kampot region produced approximately 3000 tons of the ‘best pepper in the world’. Last year the region produced 70 tons (2%). Why? Anyone they considered bourgeois including educators, physicians and other professionals, commercial traders, shopkeepers and unfortunately for them, the pepper farmers were eliminated. In this short period the pepper farms were all but destroyed. Kampot Pepper is grown in the Kampot and Kep provinces in southern Cambodia. 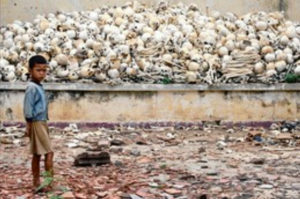 What is not widely known is that in this isolated region (in particular the Phnom Voar Mountains) became the stronghold of the Khmer Rouge rebel forces until the late nineties. That is one of the reasons why the region is one of the most undeveloped regions in Cambodia and according to SOS Children’s Villages approximately 70% of the population live in poverty. The region lags some twenty years behind the rest of the country. The Cambodian average income is only $1,093US. Figures are not available but it is certainly lower in Kampot and Kep Provinces where the pepper is grown. Children in Cambodia engage in the worst forms of child labor, including forced labor in brick making and in commercial sexual exploitation, sometimes as a result of human trafficking.. In ancient times pepper was worth more than gold by weight and was used as currency. Reviving and supporting the Kampot Pepper farming system will serve as currency for the next generation of Cambodian youth as they recover from the social and economic devastation of the mass genocide perpetuated by the Pol Pot regime. A Fair Trade distribution network can help restore production to its former heights. That would pump over $70,000,000 CDN into a stagnant economy and increase regional cash revenues by one-third. Choeung Ek is a memorial, marked by this Buddhist stupa. The stupa has acrylic glass sides and is filled with more than 5,000 human skulls.